Finally the heat has subsided and our hall is tolerable again. We voted $100 to Warm the Children, an organization that helps families buy warm clothing at Wal-Mart. We also voted to assist Social Services in Lyme & Old Lyme to provide food for Thanksgiving and Christmas. The Charter was draped in loving memory of Terry Firgeleski. Our member, Mary, announced she graduated from UConn with a Master Gardening degree. Many members, along with Nancy Beebe, worked the Grange Grill at the Hamburg Fair, cooking 32 dozen eggs, serving pie and coffee. What a wonderful pair of ladies, we are lucky to have them. 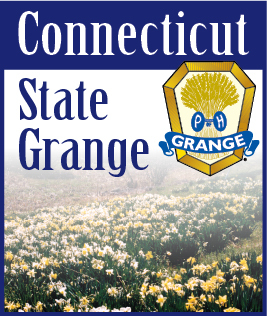 Hopefully four of our members will go to Vermont to National Grange, weather permitting. Two will take the Seventh Degree.